s there anything more fun than an epic fight scene? They don’t win Oscars, but the best stay with you. And when written well, they can say as much as any other scene in the most serious dramas. Many writers struggle with how to write action scenes. They think because they don’t know martial arts, they don’t know how to write a fight scene. Nothing could be further from the truth. 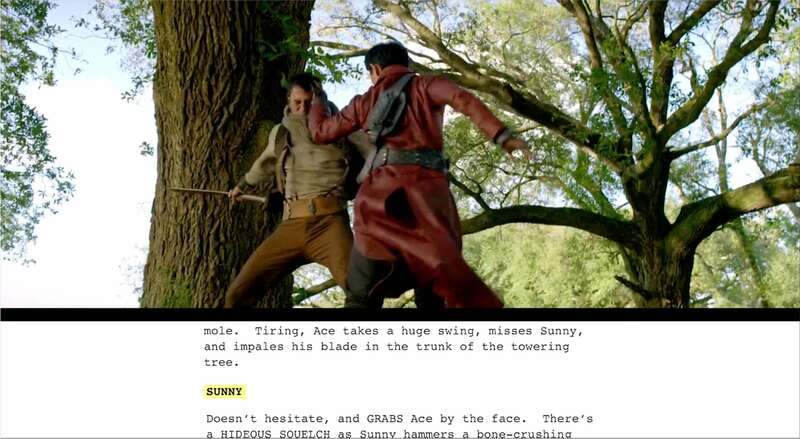 Follow our sage advice, and you’ll be writing amazing fight scenes in no time. 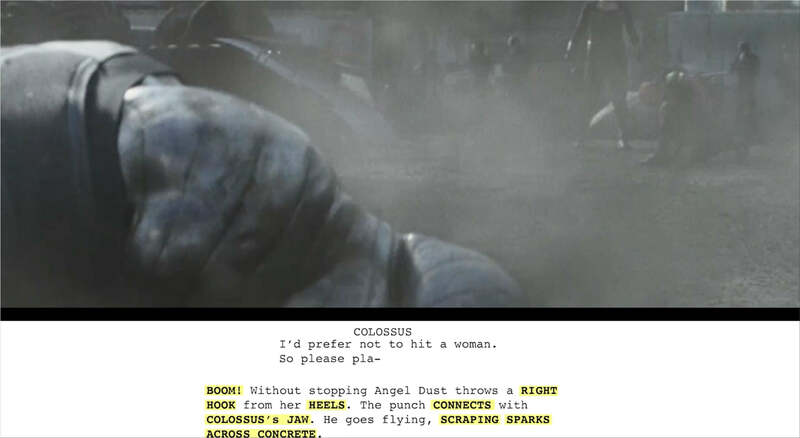 When it comes to how to write a fight scene, the most important thing to remember is that whatever you write probably won’t be actually shot that way. No matter how many kung fu movies you’ve seen, no matter if you yourself are a martial arts master, your script is just a guideline. It will be changed when it comes time to shoot, depending on the abilities of the performers and the realities of the set. The writer of The Way of the Dragon (1972) had total control over Bruce Lee and Chuck Norris’ epic fight scene, but only because the writer/director was the Dragon himself. If you have a martial arts or military background, use it! But even if you’ve never even been in a schoolyard brawl, don’t worry. It isn’t your job to work the entire stunt out blow for blow. That’s why there’s a stunt coordinator. One-sided fights aren’t very interesting. The epic fight scene of The Matrix (1999) is not at the end when Neo destroys Agent Smith without even trying, it’s the gun battle in the lobby. The only exception to this is when you're writing an action comedy. One-sided fights, especially when introducing your heroes, can be hilarious to watch. For more tips on writing action comedy the Kingsman way, watch our video. The best fight scenes have an ebb and flow -- for a moment, the hero has the upper hand, for a moment the villain. This is true whether it’s the final epic fight scene of a kung-fu movie, a gun battle between Bond and Bloefeld’s nameless goons, or a monster closing in on his kill in a slasher film. 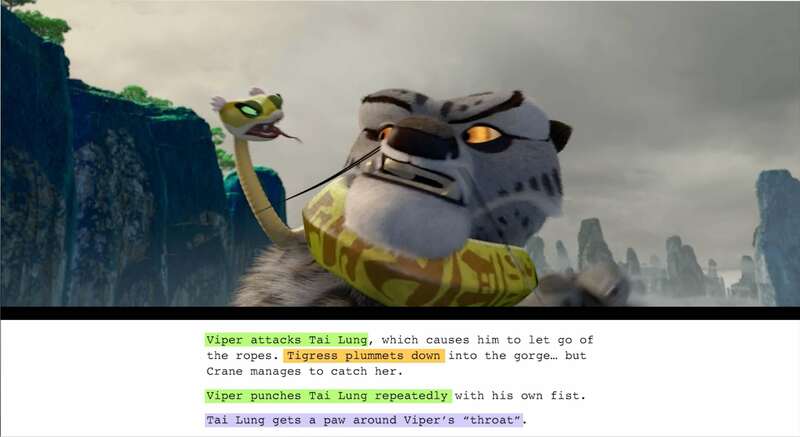 Look how often the dynamic shifts in this fight scene in Kung-fu Panda (2008). Each color is a different character. A six-person melee like this can get complex fast. The upper-hand should bounce back and forth between the parties in the fight, bouncing back faster and faster, until it culminates in an exciting and amazing climax. One of the most important elements in the best fight scenes is clarity on the page. It’s easy for a reader to be lost in the sea of text of a good fight scene. This is especially true if you actually have a martial arts background. You may think you're adding great detail, but in fact you might actually be adding more confusion. A great way to give your fight scene structure and clarity is to use subheaders. The AMC kung-fu tv show Into the Badlands (2016) uses this technique flawlessly. Arguably the best fight scene to ever appear on television. Subheaders break your fight into digestible chunks and draw attention to important elements. Whether that’s one of the fighters in the brawl, a weapon, or an environmental danger, like a collapsing roof. You can combine both the above techniques for an even greater effect. The moment one of the fighters gains the upper hand, call that moment out with a subheader. When it shifts back to the other fighters favor, call that out again with another subheader. This makes it incredibly clear how the fight is supposed to be paced, which is so much more important than the actual strikes and throws. Fights are loud, noisy, and chaotic. Even when they’re silent, their silence is intentional. The best fight scenes are felt and seen more intensely than almost any other time in your film. The stakes are as high as they get. There’s no more room for talking. You’re asking how to write a fight scene, not how to write a negotiation (that’s another article). You want your readers to see and feel every moment. Make liberal use of sound and visuals, calling them out with all caps if necessary, to make the scene come alive on the page. So many wonderful noises for Deadpool’s (2016) epic fight scene. This will help sell your script to producers and make life easier for the line producer when it comes time to make the script breakdown. You don’t need to be a fifth-degree black belt or a Marine commando to know how to write actions scenes. It can certainly help, but it’s not what’s most important. The best fight scenes are stories, like any other scene in your movie. Your job as a writer is to make them the most engaging stories possible and don’t sweat the details. After all, you wouldn’t want to put the stunt coordinator out of a job, would you? What are the best fight scenes for writers to study? Do you have any suggestions for how to make fights even more thrilling? Let us know in the comments below!